The product is recommended for use in constant velocity joints, assemblies and bearings of vehicles and industrial equipment. The grease contains pure fine-grained molybdenum disulfide due to which it reliably protects assemblies and bearings operating under peak and/or alternating loads. 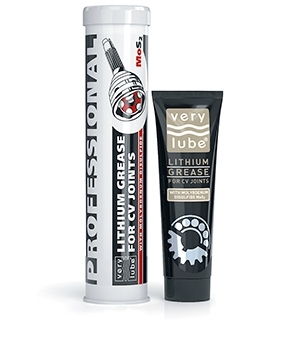 Reliably protects assemblies and bearings operating under peak and/or alternating loads. Possesses high mechanical and chemical stability, retains its protective and antiwear properties even under the influence of durable mechanical and thermal overloads. Due to its outstanding stickiness the grease remains on lubricated surfaces even if affected by vibration and high rotation speeds. The grease is waterproof and can be used in assemblies operating in contact with water. It creates a good insulation and prevents contamination of bearings. Application with the help of a filling gun for plastic lubricants. Introduce the grease into an assembly via a grease fitting until it appears out of clearances of the lubricated joint. Fill ½ of the free space of the bearing (assembly) with the grease having previously removed the old grease. The grease is compatible with all types of lithium-based automotive and industrial greases, miscible with such greases at any ratio. Applied to assemblies with the rotation speed of up to 10 000 rpm.